Use vinyl banners to send a bold message. Banners can be used as a temporary sign to promote your business or event. Use them to advertise church events, business promotions for retail stores and other situation where you want send a a bold statement. The price is very cheap therefore this should fit in your marketing budget easily. 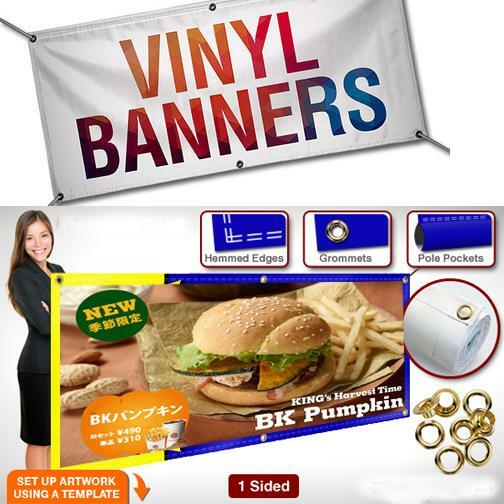 A custom vinyl banner is very versatile and can be used both indoor and outdoor. They are printed on 15oz Premium Scrim Matte or Glossy Vinyl with brass grommets. Order sizes as large as 4" x 10" or even larger. These banners are very sturdy and durable. You can use them as "Happy Birthday banner", graduations, office or store front sign, or as a sidewalk sign. Call now with an questions or request 1.800.492.1218. You can also request a price quote online.